Awhile back, there was a question about how many steam cranes were still operational in North America; along with a query on Ohio Locomotive cranes. At the time of that posting, I forgot I had a list of preserved North American steam cranes in my research for a Surviving World Steam Rolling Stock CD-ROM. It was given to me by it's author, John A. Taubeneck, and is dated May 16, 2002. 1. SP 7130; an Industrial Works 120 ton wrecking crane at the Arizona Railway Museum. 2. SCL 765157 (ex FEC 3377); an Industrial Works 150 ton wrecking crane at the Gold Coast Railway Museum. 3. Union Electric 3; an F model Ohio 30 ton self propelled crane at the Farmington and Western tourist railroad. 4. C&NW X261709; an Industrial Works 30 ton crane at the Monticello Railway Museum. 5. A Browning 25 ton crane at the Hesston Steam Society, Hesston, IN. 6. A steam crane, details unknown, at Greenwich Village in the Henry Ford Museum. 7. Nevada Northern "A", an Industrial Works 100 ton wrecking crane at the Nevada Northern Railway Museum. 8. Tacoma Municipal Belt Line RR (no number); an E model Ohio 25 ton crane at the Camp 6 Museum in Tacoma, Washington state. 9. A steam crane mentioned by a poster in the previous thread as being operational at Amherst Industries, Charleston, WV; no other details given, but gladly recieved. 10. CP 414325; an Industrial Works 100 ton wrecking crane at the Prince George Railway and Forestry Museum, Prince George, BC, Canada. 11. Canada Creosoting 2055; a D model Ohio crane at the West Coast Railway Heritage Park, Squamish, BC, Canada. 12. Central of Vermont 4251; an Industrial Brownhoist 50 ton crane at the Bytown Railway Society, Ottawa, ON, Canada. Notice that 3 Ohio Locomotive steam cranes are in the list; I have eight Ohio steam cranes out of 87 steam cranes (and three pile drivers) listed so far in North America. The ancient riveted tank car bodies are stacked up like cord wood at this site beside the 100ton or so Steam crane mentioned before on other posts. This one got past me, and I could not find it in a search of the Interchange or the web. What steam crane; what is the history behind it? Andrew, do you have any pictures of it? My goodness! I was seeing in my mind a steam crane surrounded by piles of rusted scrap metal, not trees! That place is more overgrown than Long Leaf was in the 1990s; who knows what stuff and creatures could be found in there! I wrote you off line about the crane in the Virginia Scrap Iron & Metal site 2 and sent you pictures of the crane in its current habitat. Yes it is over grown and has been for many years explaning why we can't provide any decent photo's. There have been people from rail groups in the region looking at preserving the crane, but movement currently is the largest problem with purchasing cost being second. The Scrap yard last I heard was still asking price based on tonage (Which is their right) rather than a negotiated flat purchase price leading to a higher price than most are willing to pay considering that it's land locked. But there is hope apparently in the future, new owner that is looking to take over the scrap yard is thinking about re-activating the siding, making the cranes removal that much easier. As for the rest of the steam equipment in yard 2 only time will tell what all is in there, and that may be soon if they continue to clean the place up, which is new here most of this stuff has been around over 60 or more years. So will see what we find. Please forgive my delay in responding. This has been a crazy week; I am trying to catch up with my e-mail. Thank you very much for the photographs. They are just what I was looking for, with the picture of the nameplate and a clear picture of the number on the cab. I notice in my notes that the VA Museum of Transport already has two N&W steam cranes; 514902 and 514925, both built by Industrial. I have pictures of both of them; 514908 does look like it may be an earlier model; it's serial number of 2230 suggests it as well.. It makes we wonder who else would want to give her a home. The crane at Greenfield Village was designed to be used and operated in the railroad tunnel under the Detroit River, so it's somewhat unique because of clearance restrictions..
A few years ago I saw it operate, but they were using steam from their ex Detroit and Mackinaw engine. The crane at the museum in Prince George is also operational, but because of terms set when it was donated can't be used to lift anything. Post subject: Re: Steam Cranes Revisited-other equip? Any information on the car directly behind the cab of the crane at VSI&M Site 2? The car behind the crane was an old N&W powercar. Sometime this past year someone cut a corner out of it and took the the Fairbanks Morse power unit. Someone mention that they thought it had been scrapped completely now but I am not sure. I will find out in a week or so when I get back down there and will post here about it then. Just wanted to pass along the link with a picture and information I posted on the Power car on this forum a while back. As far as I know the bulk of the car is still there and still has some good equipment that would be usable for other restoration projects. The parts of the power car that were cut off to enable the removal of the Fairbanks Morse engine were scraped or hauled away so the car can not be saved with original material. Currently there are two more of these cars known to be out there is some manor of completeness but none were as original as the one here in the scrap yard. The truck sets currently under the power car are new with little to no wear on them I can't say I've even seen friction bearing wheel sets with treads that thick; even though the car as a whole has been lost I hope that its remaining parts will contribute to future projects. Thanks for the info, and the link to the old RyPN thread with a photo of the car. Do you have the car numbers or recent photos of the N&W MofW equipment in Pulaski, VA? You can send me a private message (PM) if you wish. C&NW X261709 is at the Illinois Railway Museum. Is it a crane or pile driver? It's been MANY years since it operated. The one at Monticello should be Bates & Rodgers Construction Co. #11442; Industrial Brownhoist 30 ton crane built in 1944; listed as operable. The one at IRM is indeed a pile driver, C&NW #X261709, also built by Industrial Works as construction number 4117 in 1929. It is NOT listed in John's list as operational. Thanks for the correction; I am sorry about the confusion. 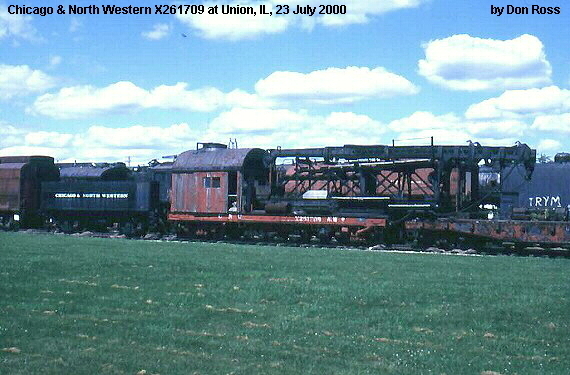 There is also a steam powered pile driver at Monticello; Illinois Central X238. Up until the last year or so X238, which is privately owned by an MRM member, operated on occassion at the museum. It powered a "train" consisting of IC side door cupola caboose #9926 (in which passengers were allowed to ride) and pushing idler flat IC X2000. At a top speed of about 2 m.p.h., the ride didn't go far, but at the end, passengers were allowed to detrain and watch as the X238 make a simple pickup of an item. Certainly not the 611 pounding down the main line, but a nice enjoyable trip complete with a gentle exhaust and steam smell and a nice sounding whistle. The X238 is currently down for a state boiler inspection if the owner decides to try to continue its operation. There is a steam crane in Mt. Savage, Maryland that has never had a fire in its firebox. I do not remember the specs, but I believe it is in the 150-200 ton range. It was purchased by the Corps of Engineers for a project that was delayed, then cancelled, due to WWII. It sat for years on a Navy base somewhere in the Tidewater. It was then moved to Moorefield, West Virginia where it again languished for years on the South Branch Valley RR. In 2001 it was auctioned off and moved to its present location. It is owned by the Mt. Savage Historical Society. When preserved it will be displayed as part of the rich railroading heritage of the town, which was home to the Cumberland and Pennsylvania locomotive shops and the site where the first iron rails in Christopher Columbus' New World were rolled in 1844.